The president was in combative mood in a speech after the signing and while answering questions from journalists. He suggested that the law was made necessary by arrogant western groups promoting a behaviour that threatens Ugandans’ “way of life”. The signing, which was delayed by more than three hours, has been condemned internationally, but was hugely anticipated by many Ugandans. The president, who first launched Galaxy International School at Lubowa, Entebbe road, signed the law at around 1:50pm East African time. Before signing, the president identified three categories of gay people – recruiters, exhibitionists and mercenaries. 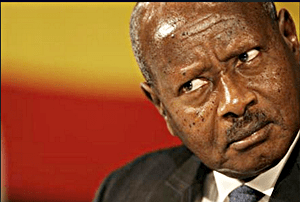 The president suggested he could not to understand how men could fail to be attracted to Uganda’s beautiful women and, instead, get attracted to fellow men. The president also paraded the mostly Ugandan scientists who concluded that homosexuality wasn’t generic. Shortly after Museveni signed the bill the Secretary of State John Kerry, issued the following press release by the State Department. “This is a tragic day for Uganda and for all who care about the cause of human rights. Ultimately, the only answer is repeal of this law. The United States is deeply disappointed in the enactment of the Anti-Homosexuality Bill in Uganda. For the four years since the bill was introduced, we have been crystal clear that it blatantly violates human rights obligations that Uganda’s Human Rights Commission itself has recognized are enshrined in Uganda’s Constitution. Today’s signing threatens a dangerous slide backward in Uganda’s commitment to protecting the human rights of its people and a serious threat to the LGBT community in Uganda. “We are also deeply concerned about the law’s potential to set back public health efforts in Uganda, including those to address HIV/AIDS, which must be conducted in a non-discriminatory manner in order to be effective. As President Obama stated, this legislation is not just morally wrong, it complicates a valued relationship. Now that this law has been enacted, we are beginning an internal review of our relationship with the Government of Uganda to ensure that all dimensions of our engagement, including assistance programs, uphold our anti-discrimination policies and principles and reflect our values. It is time for us to do our due diligence and pressure our government to halt all aid to this hell-hole and do our best to expose Scott Lively, LaBarbera and all the other “Christian” leaders who go abroad to specifically spread this hate. It is time that these stories reach the mainstream media outlets and escape the gay media bubble. It should be insisted that Gays arrested in Uganda and elsewhere be Arrested in the Proper Name. In the name of God seems too general.In the Name of Jesus or Jesus and the evangelical christian right.Maybe in the name of Jesus and the American Evangelist. It seems that Responsibility should be laid at someones feet.